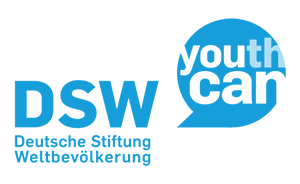 DSW Youth Meet-Up 2018 – introducing our youth advocates! Last week we introduced our Youth Meet-up 2018 – our effort, alongside partners Dance4Life and CHOICE, to get youth voices heard in the hall of power in Brussels. We are kicking off our activities today, so it’s a good time to introduce our awesome youth advocates who will be in Brussels this week! We’re thrilled to have a broad mix of genders and parts of the world representing this week. And will be giving them all a chance to tell you their story themselves throughout the week on Facebook, Twitter and Instagram – so keep a look out for that! Muneeb Kamal, aged 24, is passionate about enabling an environment in Pakistan through which young people can truly exercise their sexual and reproductive health and rights. He manages several youth alliances and networks so participating in the Youth meet up event would give him an opportunity to share the voice of young people from Pakistan, promote inclusive decision making and to have a chance to influence the manifesto of European parties for the 2019 elections. Rekha Trikhatri, aged 26, has been campaigning for young people’s SRHR rights in Nepal for many years. She sees the youth meet-up as a great platform for her to represent Nepal and the young people she works with who don’t have access to health services, comprehensive education and equality. She has a good knowledge of the sustainable development goals due to working to orient young people from all across Nepal on these goals, through different projects including for Dance4Life as a trainer. Yordanos is 24 years old and has good communication and SRH knowledge and skills. Currently she is working at a Talent youth Association, which used to be DSW Y2Y Club and currently an independent youth association. She has health background and rich experience on national and international AYSRH dialogue and discussions. 25 years old, Angella is a youth champion trained by DSW in SRH/FP advocacy and now working as a youth network volunteer for Action 4 Health in partnership with Muvubuka Angunjuse –One of our strong Youth empowerment centre hosting the youth network as a platform for youth to advocate for their health and socio-economic issues. The centre is attached to a government health facility where the youth access youth friendly health services. Angella as a youth champion is also involved in peer counselling and youth friendly referrals for better service delivery. James Atito is 25 years old and health advocate champion. Coming from a poor family of 13 siblings who were orphaned by HIV and TB at 10 years of age, he has grown under care of my aunt until completion of form four. I came to Mombasa in December 2010, to such for greener pastures. Not being able to proceed with his higher education, he landed in a water vending job. In 2011, James got interested in the health and livelihood empowerment program that focuses on providing information and life skills to all youths and adolescents on SRHR issues, proper nutrition and communicable diseases in order for them to make informed choices in their lives. Since 2015 he has served as the senior advocacy champion on matter of HIV/AIDs, sexual reproductive health & rights and Communicable diseases under the Health Rights Advocacy program. She is 21 years young girl, pursuing a degree of project planning, management and community development, youth leader and activist, doing advocacy on SRHR and Gender issues in Tanzania and Africa. At age 15, she was conscious enough to see the problems and challenges girls of her age faced, and women went through, and she resolved to learn , engage and advocate about their lives, their rights and place in the African and world community, and Tanzania in specific. She began her Journey in her early years of secondary school, volunteering in Femina Clubs, as a club chairwoman, and later as a member of the Femina National Youth Advisory Board (YAB). Passionate on SRHR advocacy and committed to helping various Femina national programs, she was featured on the front cover of 2016 Femina Journal, the organization she is volunteering team member on the national girl advocacy TV program called NGUVU YA BINTI. As we get closer to World Contraception Day on Wednesday September 26, we will be sharing their thoughts on the importance of family planning, contraception, and SRHR – and what Europe can do about it!